This is the home of the Book Arts Web which features links to a large selection of book arts related sites on the web, including educational opportunities, professional organizations, tutorials, reference materials, and galleries with images. This is also the home of the Book_Arts-L FAQ which features full subscription information for this listserv of almost 1500 individuals but also the full archives organized by year, then month. They are also fully searchable and contain a treasure trove of all kinds of technical tips, announcements, and helpful banter. The website and listserv are both maintained by Peter D. Verheyen. See his Pressbengel Project blog for more information. The Book Arts Web at the center of the the universe. Graphic was created by the Touchgraph Google Browser and is based on an analysis of all links to and from a particular site. Click to enlarge image to 1024 x 768. A different visualization of how sites are linked to another can be seen at Kartoo. 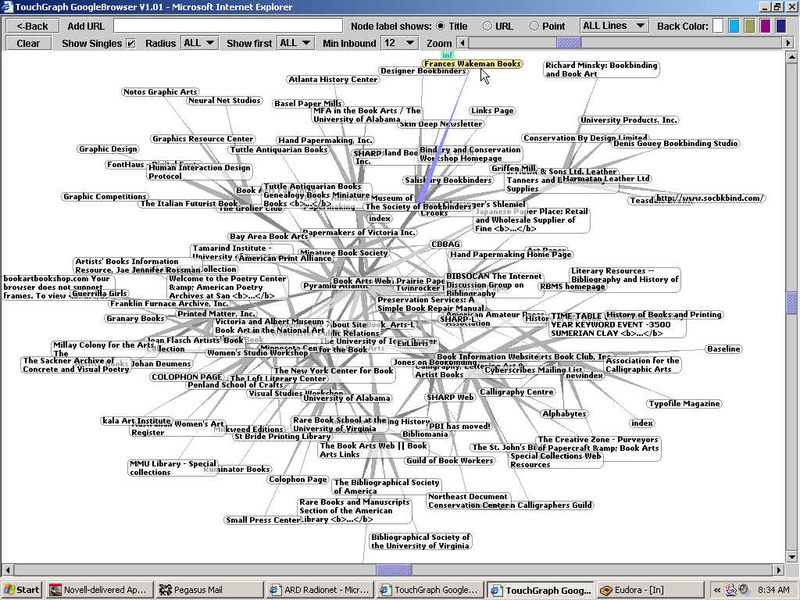 The Book Arts Web at the Wayback Machine of the Internet Archive. Translation of an article in Korean about the book arts which heavily cites the Book Arts Web. The original Korean article is also online. The automated translation by Altavista's Babelfish is poetic to say the least. Cited in Book Arts on the Internet, a review of selected Websites. The Designer Bookbinders Newsletter, Autumn 2004. Discussed were the Book Arts Web and Book_Arts-L. Interviewed in connection with the Bonefolder and for the Society of Bookbinders Newsletter, April, 2005.